Book Review by George S.: A. G. Macdonell is best known for his comic novel, England, Their England. 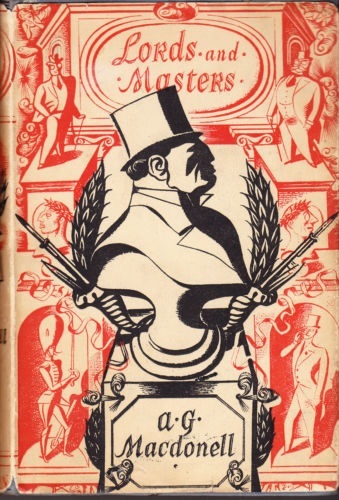 Lords and Masters is a comic novel, too, but the humour is much blacker, tinged by despair at the international situation during the 1930s. The novel centres on a wealthy Kensington family. James Hanson is a self-made man who has made his fortune ruthlessly in the steel industry, happily profiting from the century’s wars. He does not have a high opinion of his children, all but one of whom lack his energy and enterprise. Two of the three boys are Army officers of the most unimaginative kind, and the other a Conservative politician; all three are utterly conventional and lacking in initiative. His daughter Eleanor is a very soppy specimen who does good works, rather fruitlessly. The exception to the children’s lack of energy is the younger daughter Veronica, who returns from Germany a convinced, committed and rather terrifying Nazi. The plot is driven by a new invention, Perdurite, a material stronger than steel, which will revolutionise the armaments industry. A key raw material for the manufacture of Perdurite is Gloxite, found only in Cimbria, the country where Hanson first made his fortune. Hanson realises that this invention will lead to an arms race, and probably to war. After you gentlemen, the rulers of the world, had settled your little differences at the cost of ten million young men, the survivors naturally hoped to return to peaceful vocations. You gentlemen had unfortunately forgotten to supply them. He had also been mentioned in dispatches and awarded the Belgian croix-de-guerre for his gallantry during the March retreat of 1918, when as staff officer on the staff of the Sixth Army, he had rescued single-handed the entire personal effects of his General, including his gramophone and two hundred and fifty records of contemporary musical comedy and revue, during the sauve qui peut from Army headquarters. The novel tells of devious plots and counter-plots and underhand Stock Exchange dealings connected with Perdurite and Gloxite. Part of the scheming involves Crawford pretending to love Hanson’s daughter, in order to get his hands on her money. Hanson sees through him but takes the view that she is old enough to make up her own mind, and leaves her to decide her own future, which turns out to be predictably grim. She knew little about Mr. Wilde’s writings and career but she did know that he had introduced into England some starnge crime – she knew not what – whether from Egypt or from some place even worse – and had been so promptly and decisively dealt with by the Conservative Government then in office that it, and he, had been finally and forever extirpated from British shores like rabies. It was all a great tribute, thought Mrs Hanson on the very rare occasions when she did think of anything except her husband, her three sons, and sometimes her two daughters, to Lord Salisbury. Then there’s Veronica, the Nazi daughter, who arrives from Nuremberg full of frightening energy. ‘What fellows?’ asked the bantam in a voice like a frozen rasp. ‘The German armies on the Western Front, my child, with all the allies rushing after them as hard as they could. And even so they found it hard to keep up with the Germans. They bolted so fast, you see.’ he added by way of explanation. Veronica impertinently yawned back at him. ‘Propaganda,’ she said with a sigh. Macdonell is deeply cynical about a world in which lies can be so forcibly believed, and his cynicism gives a real energy to his story, as rogues outwit rogues and fools suffer for their folly. The dark humour becomes dark prophecy at the end, though, when the plot to stop the war fails. There is a change of tone into angry horror. You can see why Macdonell thought he needed to do this in the late thirties, to give his reader an ugly jolt. It makes uncomfortable reading, and perhaps it damages the book, which up till then has been light-hearted in its scorn for those who rule the world. But Macdonell is telling us that, although cynical scorn is the only rational response to dictators and appeasers, it may not be enough to avert catastrophe. This book is a real page-turner, with a strong narrative and a wit that I really enjoyed. And it’s also a very interesting document of its time.